Content marketing is a most important type of digital marketing. Today, it’s still barely or badly measured beyond clicks and views. How to best measure your content performance? That varies by its purpose, role in your overall marketing campaign, position in the customer journey, and how important it is to your marketing strategy and objective. Because of this, focusing your marketing budget on content that performs can be a complex job. But here’s a simple tool that comes to the rescue. It makes complex matters of measuring and managing content marketing effectiveness a lot easier. How TrenDemon Helps Your Company? Generate 30%-180% more conversions from your content. In a nutshell: TrenDemon, a relatively new software that learns intelligently which pieces of content bring prospects on the fastest to the destination of the close-won sale. Then, as it learns, it cohorts new prospects to take that fast-track customer journey also. While acting and learning granularly, Trendemon is an aid to automatically improve your big picture, your content marketing ROI. TrenDemon also helps digital marketeers and sales reps by integrating with your Marketing Automation and CRM. This supercharges your assets’ performance, and helps in delivering sales-ready leads. Find the real value of a brand’s content marketing efforts. Know what to write about and where to promote it. From your web team’s point of view: it’s super simple. As all they have to do is place a cookie on your website and/or blog. After that, the digital marketing specialist team sets the goals, such as sign-ups, reads and sales. Using some basic kick-start goals, you can be up and running within 20 minutues. Then, let the TrenDemon software do all the work for you. TrenDemon – How does it Work? Optimizing Journeys with Content Recommendations — TrenDemon’s Content Recommendation Unit is Personalized, Performance-driven and fully customizable. Optimizing Journeys with Call-to-Actions — “Before you go, we’d like to give you a free gift” – popup – TrenDemon’s Exit Intent Call to Action (CTA) which is shown as a user is about to leave the page. The CTA can include a lead form which integrates to marketing automation and email platforms. Gain Insight into The Overall Impact of Content On Your Goals Using TrenDemon’s Backend — clearly see how your content is impacting your business goals, and how your typical content journeys to conversion look like. Gain Insight into Typical Journeys from Sources & Campaigns – See which content performs best on which source and in relation to any goal. Want to Strengthen your Content Marketing Effectiveness? 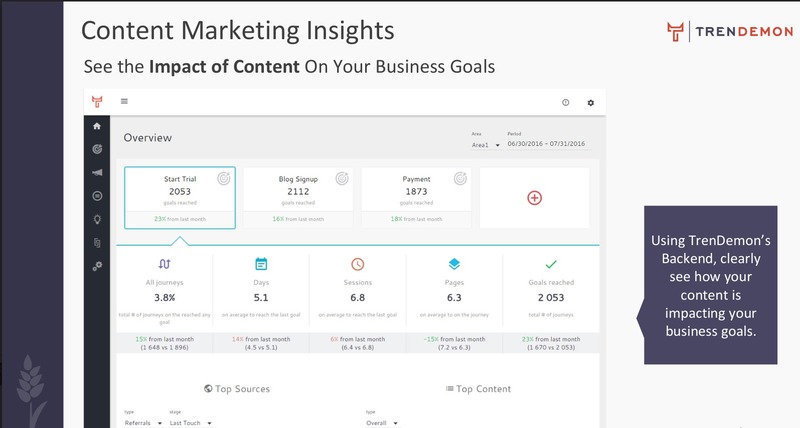 Clarify that ever-echoing question: “Is our content marketing worth it?” In a free 20 min demo we’ll show you how you could use this content marketing management software for your benefit. After the demo, we will send you a free information pack, and help you get organised to try it out for yourself. Leave us you details below, and we’ll set you up.